Some investors consider hedge funds mysterious, aggressively managed investments that may be too risky for the typical portfolio. But skeptics may be surprised to learn that the majority of hedge fund managers focus on providing capital appreciation with lower volatility than the broad markets. Despite the misconceptions, the popularity of hedge funds continues to grow. Hedge fund assets have climbed from US$38 billion in 1990 to US$2.8 trillion in 2015,1 representing a significant change in asset allocation, perhaps the most meaningful shift since many investors began moving their money from bonds to stocks in the early 1980s. Of note, it is not only institutional investors shifting assets to hedge strategies; individual investors are also moving into the space. The advent of liquid alternatives fund structures, which offer hedge strategies through a mutual fund vehicle, has helped drive this shift. These structures provide wider access to hedge strategies, and can offer potential benefits in terms of liquidity, fees and transparency. Broadly speaking, traditional access to hedge funds via private placement vehicles often meant less liquidity, with redemption periods restricted to monthly or quarterly windows. In addition, visibility into portfolio holdings—or transparency—was limited. Liquid alternatives by contrast offer daily liquidity, security-level transparency and fees that are typically lower than those associated with traditional hedge fund vehicles. And, unlike hedge funds, liquid alternative portfolios in the United States, for example, must adhere to the same regulatory requirements as US-registered mutual funds, sharing information that private placements are not required to disclose. Such liquidity, flexibility and transparency have persuaded a wider range of investors to use hedge strategies as a complement to more traditional portfolios. Recently, interest in hedge strategies has intensified. I think this is because investors are facing a dilemma. They are searching for yield but interest rates from fixed income products have generally been low, and there is fear that equity markets could be nearing a period of intensified volatility. In addition, many investors are looking for greater diversification in their portfolios (i.e., lower correlation2to traditional asset classes such as stocks and government bonds). Using non-correlated strategies within a portfolio can help smooth out the ride when one particular asset class or strategy may be experiencing a volatile period. Additionally, hedge strategy managers can take short positions that benefit from market declines, cushioning a traditional long-only portfolio. Hedge fund investment strategies are diverse and their returns have often been derived from non-traditional sources. In general, they may seek to take advantage of market inefficiencies such as pricing differences and relative discrepancies between securities such as stocks and bonds, technical market movements, deep fundamental valuation analysis, and other quantifiable trends and/or inconsistencies. Again, the majority of hedge strategies seek to capture gains from market inefficiencies while seeking to reduce market exposure. Four common strategies used by hedge fund managers include: long-short equity, relative value, event driven and global macro. When employing the long-short equity strategy, hedge fund managers take a long position in a stock they think will outperform, while shorting stock3 that they believe will underperform. The relative value strategy encompasses a wide range of investment techniques that focus on pricing inefficiencies between two similar securities. Hedge fund managers occasionally use convertible bonds to deploy this strategy. Convertible bonds, which are bonds that may be exchanged for a specific amount of a company’s stock at a future date, may be priced inefficiently compared with the value of a company’s stock or its straight bonds. All things being equal (if, in other words, the coupons are the same), if the durations5 are the same, a convertible should be priced at a premium to straight debt because there is, presumably, value in the potential for the underlying equity option embedded in the convertible. Here’s a hypothetical example: During the financial crisis in 2008, the convertibles of a large manufacturer were yielding 14%, while its straight debt was yielding 11%. That scenario presented a relative value opportunity because the market was pricing the convertible 300 basis points lower (3%) than the equivalent duration straight debt. Relative value managers could have taken a simultaneous long position in the manufacturer’s convertible bonds and offset it with a short position in the company’s equivalent duration straight debt to capture the 300 basis-point price differential. Event-driven managers invest in securities of companies in the midst of corporate events such as bankruptcies, changes in capital structure, or mergers and acquisitions. When a firm announces, for example, that it plans to acquire another company, the target company’s stock will generally rise in value, while the acquiring company’s will fall, typically due to the uncertainty surrounding any acquisition and because the acquirer usually has to pay a premium over what the target company is worth. The event-driven manager would likely take a long position in the target company’s stock and sell short the acquiring company’s shares. Global macro strategies focus on top-down macroeconomic opportunities with numerous markets and numerous investments, including currencies and commodities. When considering their investment choices, global macro managers take into account many factors, which may include a country’s or region’s economic indicators, as well as central bank trends and divergences. While the strategies employed by hedge fund managers are diverse, traditional hedge funds typically offer a single manager and a single strategy. Granted, some hedge fund managers may invest in multiple strategies, but, in the end, an investor is still left with the style of just one manager. In contrast, many liquid alternatives funds are multi-strategy funds that invest in different managers within the same strategy, or different managers within different strategies. A multi-strategy approach strives to provide a constructive level of diversification within a portfolio.10Further diversification through selecting multiple managers within each strategy may also help mitigate manager-specific risks. Managers can have varying styles or approaches within the same hedge strategy, possessing expertise within a certain area (e.g., region, sector or financial instrument). Among the various types of hedge strategies, each may perform differently in a given market environment, so I believe it’s key to have experienced professionals tilt toward strategies that have the largest potential opportunity set for returns in a current market environment and in the forward-looking market environment. 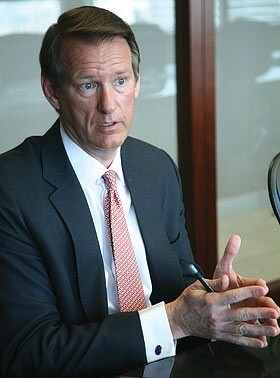 David Saunders’s comments, opinions and analyses are the personal views and are intended to be for informational purposes and general interest only and should not be construed as individual investment advice or a recommendation or solicitation to buy, sell or hold any security or to adopt any investment strategy. It does not constitute legal or tax advice. The information provided in this material is rendered as at publication date and may change without notice, and it is not intended as a complete analysis of every material fact regarding any country, region, market or investment. Get more perspectives from Franklin Templeton Investments delivered to your inbox. Subscribe to the Beyond Bulls & Bears blog. For timely investing tidbits, follow us on Twitter @FTI_Global . 1. Source: © HFR, Inc., HFR Industry Reports, as of January 2015, www.hedgefundresearch.com. 2. Correlation will range between 1 (perfect positive correlation, moving in the same direction) to -1 (perfect negative correlation, moving in opposite directions). 3. A short sale is the sale of a security that the seller has borrowed, typically from a broker, and promises to return at a future date. The broker sells the borrowed shares, and the proceeds are credited to the seller’s account. On a specified future date, the seller must buy the same number of shares borrowed and return them to the broker. If the share price has dropped in the interim, the seller can now buy the shares back at a lower cost and make a profit on the price difference. If the share price rises in the interim, the seller will pay a higher price for the shares, which will result in a loss. 4. Past performance does not guarantee future results. 5. Duration is a measurement of a bond’s—or a portfolio’s—sensitivity to interest-rate movements. It measures the number of years required to recover the true cost of a bond, considering the present value of all coupon and principal payments received in the future. Generally, the higher the duration, the more the price of the bond (or the value of the portfolio) will fall as rates rise because of the inverse relationship between bond yield and price. 6. Past performance does not guarantee future results. 8. Indexes are unmanaged, and one cannot invest directly in an index. 9. Past performance does not guarantee future results. 10. Diversification does not guarantee profit or protect against risk of loss.